In an effort to reduce use of plastics and create a healthier environment, 2017 Annual Town Meeting voted to ban the distribution of plastic check-out bags and the sale of plastic water bottles (1 liter or less) by Sudbury retailers. The new bylaws go into effect on June 30, 2018. 1. 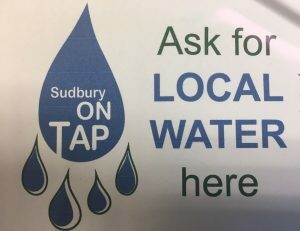 Visit Sudbury on Tap at www.sudburyontap.org for a map of participating businesses that have agreed to fill any reusable water bottles with tap water. Look for the Sudbury on Tap “Ask for LOCAL WATER here” stickers on the front door of businesses. 2. 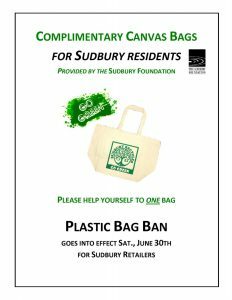 Through a grant from the Sudbury Foundation, a limited number of reusable cotton canvas bags will be made available to Sudbury residents at the Senior Center and Flynn Building. They will also be available at the Medical Reserve Corps tents at 4th of July and Touch a Truck festivities. It is anticipated the bags will be available by June 30th. A limited amount of refillable water bottles will be available as well. 3. We would like to thank the business community for efforts to implement these by-laws and understand there may be remaining questions or concerns. Please call the Health Department at 978-440-5479 for assistance if needed.